One opportunity for improving the way climate-related security issues are accounted for may be the election of a new UN Secretary General. A successor to Ban Ki-moon will be chosen at the General Assembly later this year. Asking the candidates to address climate-security threats would continue the conversation and momentum. 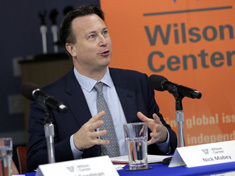 Nick Mabey spoke at the Wilson Center on May 6, 2016.